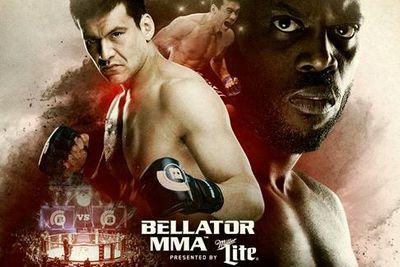 The fifteenth Bellator MMA event of 2015 featured “Kato vs. Manhoef” — also known as Bellator 146 — which took place Friday night (Nov. 20, 2015) inside WinStar World Casino in Thackerville, Oklahoma, and streamed live on Spike TV. The main event was a clash of Middleweight contenders with different career trajectories. Hisaki Kato was trending up thanks to a highlight reel knockout in June, while Manhoef hadn’t won a fight in over a year. Did Manhoef end his skid, or did Kato make his bid to fight Rafael Carvalho for the Middleweight title? Manhoef proved the old lion isn’t giving up his status in the pack just yet. Kato was targeting the liver with body kicks, and was faster with his hands in the exchanges, but any advantages vanished with just one left hook that made Kato fall backward and his eyes roll up. The official time was 3:43 of R1. Manhoef spoke to Jimmy Smith after the fight’s explosive end.